Welcome to the start of a brand new work week! We want to thank you for joining our Host, Jamie Meloni for #ThatBusinessShow every weekday! Start your morning right with Jamie as he brings on the people that positively impact your community on the #MorningAir! Coming on to share what they are doing for the Tampa Bay community today was Dale Gordon, Executive Director of Film Tampa Bay! We were also joined by Michael LaBrecque, Vice President of Benzer Pharmacy! Discussing the ins-and-outs of what they do, you don’t want to miss them on the #MorningAir, so head to http://www.tampabayradio.com for the #MorningDiscussion, and to listen to any show on demand! Also, check out Jamie’s YouTube Channel at http://www.youtube.com/jamiemeloni to watch any of our livestream video! 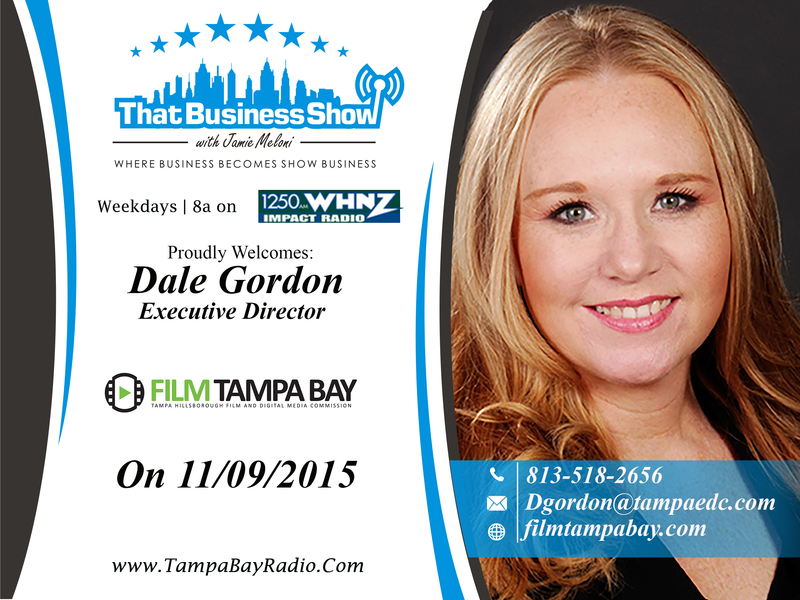 First on #ThatBusinessShow with Jamie Meloni was Dale Gordon, Executive Director of Film Tampa Bay. Executive Director of the Tampa Hillsborough Film and Digital Media Commission, Dale Gordon is responsible for raising awareness of the area as a great destination for film and digital media production. In order to attract companies to use Tampa and Hillsborough locations in movies, advertisements, music videos, video games and other digital media and production opportunities, Gordon works with government entities to rebuild film and production resources. #HelpingOurCity, Dale really makes a positive impact on our creative community, and fosters economic growth through film, commercials, and education! If you missed Dale Gordon on the #MorningAir, then head to http://www.tampabayradio.com now to listen to her on #ThatBusinessShow! If you want to find out more about Film Tampa Bay, head to www.filmtampabay.com! Mike LaBrecque joined Benzer’s leadership team in 2015 as Vice President of Specialty Pharmacy. Throughout his career, Mike has been respected for his extensive knowledge and expertise in many segments of the pharmaceutical industry including specialty pharmacy, mail service pharmacy, retail pharmacy, PBM, and health plan management. Coming on the #MorningAir to discuss Benzer Pharmacy, Mike told our listeners about how Benzer Pharmacy is different, providing more personalized service, with a focus on the customer rather than profit. Different than your run off the mill – large corporation pharmacy, consider Bender Pharmacy for your pharmaceutical needs! As a seasoned professional with more than fifteen years of specialty pharmaceutical knowledge, Mike has experience in providing valuable insight about business development, operations, payer contracting, supply chain management, benefits management, strategy development, and countless more. 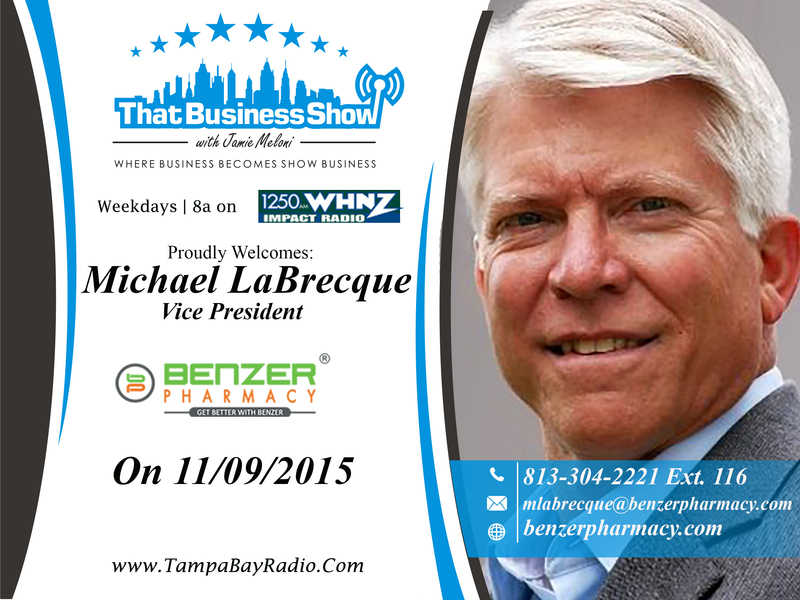 Find out more about Mike LaBrecque and Benzer Pharmacy at http://www.benzerpharmacy.com! This entry was posted in Articles, Business, Entrepreneurship and Business, Work and tagged business, community, film, interview, live, radio, talk, tampa bay, work. Bookmark the permalink.